Our project aims to address a constellation of social and environmental problems in Milwaukee, Wisconsin that can be seen as connected from a systems perspective, and addressed collaboratively through a systems approach. First, tens of thousands of residents do not have adequate access to safe, affordable food even in the peak of growing season, partly because urban soils capable of producing fresh produce have been paved over, compacted and contaminated. Meanwhile, city residents and businesses generate an estimated 47,000 tons of food waste annually, and much of that organic matter is sent to a nearby landfill that serves four counties in Southeast Wisconsin. This presents two more problems: it contributes to the constrained capacity of the primary landfill accepting the city’s municipal solid waste, and despite the landfill operator’s efforts to capture the methane from organic decomposition, the EPA reports that significant quantities of methane escapes into the atmosphere and pose dangerous anthropogenic interference with the climate system. (EPA 2016) A fourth problem is that older portions of Milwaukee sewer system are forced to release untreated wastewater into Lake Michigan during heavy rain events. By assembling an interdisciplinary, multi-sector team of partners, our project will create a plan that substantively addresses all of these four problems by diverting more of Milwaukee’s food waste to composting, and utilizing the increased compost production to improve soil in the city for gardening, farming and rainwater absorption. A team of university faculty and students will interview and collect data from a diverse group of stakeholders in the Milwaukee region, including food waste generators, food waste haulers, composters, urban and peri-urban farmers, gardening organizations, and public agency staff. The information will be used to conduct supply chain analysis, to model the existing food-waste-to-compost system, and to compare different scenarios for expanding it. Frequent contact and meetings with stakeholders will use the results of our research and analysis to create of a collaborative, multi-year plan that could involve public and private infrastructure investments, policy changes, promotional campaigns, and other actions. The plan will aim to maintain a balance of food waste supply and demand compost demand as the system grows. We will share our process and results with other cities facing a similar set of interconnected problems by ramping up food waste composting at metropolitan scale. Through an interdisciplinary systems approach supported by the Cooperative Institute for Urban Agriculture and Nutrition, we will combine a macro-level analysis of food waste supply and compost demand with micro-level compost trials and supply chain analysis on a 1.25 acre urban farm in Milwaukee. The primary outcome will be a collaborative strategy to increase supply of affordable compost to enhance the profitability of urban farming that provides a model for other North Central Region cities. Food waste generators, haulers, composters, farmers, and public agency staff will share knowledge to design and launch a multi-year plan to increase supply of affordable compost that meets the varied needs of urban agriculture in Milwaukee. Participants will coordinate feedstock supply to minimize transportation costs and anticipate end-product demand. Information will be generated to guide public policy and investments in new sites for waste transfer and composting. Private sector efforts to generate soil for food insecure neighborhoods will be celebrated. Evaluation methods will track food waste diversion and compost utilization to guide future modifications and share results with other cities. Our planning process will collect and share information incrementally, gradually building a baseline of common knowledge and trust while respecting private interests and independence. The plan will enhance existing collaboration among some stakeholders while encouraging new partnerships and public-private sector alignment. Not everyone will choose to participate, but the plan will evolve with those who do. We will track any new collaborative activities that can be partially attributed to the planning process. The completed plan may only be five pages long but will include appendices supplied primarily by students supervised by academic faculty and staff. Collaboration occurs even in the most competitive industries and is especially critical in emergent systems like food waste composting. By pulling together this proposal, we feel confident that our project’s success will be of interest to other NCR cities. Another product will be a series of professional videos (20-30 minutes total) outlining our process and results. Finally, through compost trials and field days we will identity farmers’ compost-related educational needs by uploading new and existing peer-reviewed composting information to a website developed for urban agriculture in 2015 by one of our participating faculty: http://urbanagriculture.horticulture.wisc.edu. For such a large project with many interconnected parts, a critical evaluation tool will be the Work Plan Timeline we submitted as an attachment. This provides a month-by-month description of who is taking the lead on activities, where they will occur and who will provide support. It has been shared with all major participants, collaborators and advisors and will enable us quickly address why any activities are not proceeding as planned. As we have stated often, our primary deliverable will be a “collaborative multiyear plan” involving private stakeholders across the food waste-to-compost-to-farm supply chain as well as public sector agencies. Therefore, during the project we must evaluate whether the information we are assembling is sufficient and appropriate for developing that plan. For this assessment we will ask all collaborators to refer regularly to the 12 questions listed in our Approach to confirm whether our research is addressing them. The questions may also be amended and expanded over time. We cannot expect to answer every question completely, but we need everyone to feel confident that the quality of data is sufficient for individuals to make decisions with respect to an evolving collaborative plan. Our means of evaluating the finished plan will be qualitative and quantitative. Quantitatively, we will consider the number of participating private sector entities who sign onto the plan, their company size in terms of employees, the growth in the amount of food waste they are committing to divert from landfills to composting system generate, the number of urban and peri-urban farmers who are identified as interested compost customers, and the projected increase in the amount of compost that is distributed affordably to food insecure neighborhoods of Milwaukee. Long-term outcomes, like reduction in methane gas and increase in food security, cannot be evaluated as part of our project, but the collaborative multiyear plan will include measures to assess progress in those goals over time. Qualitatively, we will ask all project participants, including any who choose not to participate in the collaborative multiyear plan, whether or not the process was productive and fair, and what recommendations they would make to other cities seeking to replicate our efforts. We will also commit to using the evaluation metrics provided in the SARE application appendices (farmer participation, new collaboration, citations, etc.) during and following the project, and an expanded version of the outreach survey for our field days. Another important product is a set of videos that will help other communities learn from our effort. We will upload them to YouTube soon enough to solicit feedback from academic and community partners to help us evaluate whether the videos are effective at explaining our process and results in a compelling and useful way. Finally, for our commitment to assemble and upload relevant composting information to a national urban agriculture website, we will evaluate the quantity and quality of those resources. We see two different audiences for our project: the larger community in Milwaukee and SE Wisconsin; and other cities in the North Central Region and nationwide. Regarding the local audience, we could not possibly invite all potential Milwaukee area stakeholders into our SARE proposal process. Two important groups who are underrepresented are food waste generators (restaurants, supermarkets, cafeterias, breweries, coffee roasters, food processors) and neighborhood leaders and residents. Once the project is underway we will ask the Milwaukee Journal Sentinel and the Milwaukee Community News Service to help us publicize the effort. And several of our partners—Will Allen, Antoine Carter, Gretchen Mead, Tim McCollow, etc.—have deep ties throughout the community and we ask them to raise awareness of other local leaders. As for the NCR and national audience, our main outreach product will be a series of professionally edited videos, 20-30 minutes in total, that use short interviews, photos, B-footage, and PowerPoint slides to provide an overview of the entire process of our project and its final results. Some of our academic partners have asked if they can publish results from their portion of the project work, and of course we will encourage and support that. But we believe the audiences we hope to reach—public agency staff, commercial composters, urban farmers, food security advocates, food waste generators looking for more environmental options—are more likely to gain value from audio-visual presentations. However, our Final Report to SARE will provide a readable text, tables and graphics summary of the project as well. We will distribute links to the videos and the Final Report via national list serves like the Community, Local and Regional Food Systems that includes Extension colleagues across the country, and we will offer to host at least six “GoToMeeting” webinars near the end and immediately following our project to discuss our process and results with leaders from individual cities in the North Central Region. Finally, we will be uploading resources on composting to the national urban agriculture website (http://urbanagriculture.horticulture.wisc.edu) that was launched this year by one of our project’s academic advisors, Dr. Julie Dawson. The resources we add will consolidate existing resources that describe best practices or offer data and tools for improving composting efficiency and product quality using food waste, yard waste and other sources of nitrogen and carbon feedstocks. The materials will by vetted by Dawson with additional peer review as needed. The research in our project was not designed to test a specific hypothesis. Rather, it is meant to inform a planning process with a multi-sector group of stakeholders, with goals of diverting more food waste away from the landfill toward local and regional composting facilities, while ensuring sufficient demand for the resulting end products. What sources of food waste in Milwaukee are already being composted? Who is composting Milwaukee’s food waste now, and where? What are the most promising new sources of food waste? What constrains composters from expanding food waste composting? What qualities are urban and peri-urban farms and gardens looking for in compost? How do different mixes of food waste and other organic material affect compost quality? What types of compost are appropriate for different urban farm practices, products and existing conditions? How knowledgeable are urban farmers of the benefits of using different compost mixes? Would food waste generators favor greater recognition for their efforts to compost if it went to farms and gardens in food insecure communities? How might the plans of public agencies to divert food waste from landfills and develop green infrastructure boost the supply of affordable compost for urban agriculture? Could changes to existing city codes and regulations facilitate composting in the city? Could new composting facilities or transfer stations in the city lower transportation and handling costs? We did not expect to answer any of these questions completely, but well enough to develop and actionable plan to expand the food-waste-to-compost system in the Milwaukee region while making more compost available for building soil in food insecure areas of the city. We expected that the questions might change somewhat as we proceeded, and more questions would arise. The first six bullets above involve standard qualitative research methods and were designed to answer Questions 1-4 and 9-12 above. The compost trials at Cream City Farms on the north side of Milwaukee were designed to help us answer Questions 5-8 above. 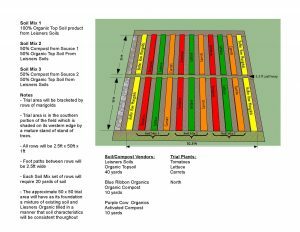 The research design for the compost trials were explained in detail in our proposal. We made some modest modifications to that approach, which are not able to document at this point in the project. The trials were run in 2016 and we have only begun to document the results. Most of the research activities were conducted by students at UW-Madison and UW-Milwaukee. Three students were paid with SARE grant resources, and about 40 students contributed effort as part of their course studies. What follows is a preliminary review of our results for our 2017 annual report to SARE. The meetings that we held with stakeholders during the proposal stage continued after we were funded and have provided substantial research value. These meetings combined private visits with individual stakeholders, subsets of similar stakeholders (including direct competitors), and “All Partner Meetings.” Once relationships became established, we used video conferencing more often and effectively to reduce travel time and costs for all involved. One of our most important research contributors from the fall of 2016 to August 2017 was a UW-Madison graduate student, Tim Allen, who earned his master’s degree while conducting research under the guidance of his academic advisor, Stephen Ventura, and project coordinator Greg Lawless. Tim conducted multiple interviews with several key private sector actors in Milwaukee’s food-waste-to-compost supply chain, and the data he collected and presented in his thesis has been crucial to our subsequent modeling of that supply chain. Meanwhile, a graduate student at UW-Milwaukee, Nicole Enders, assisted by Donna Genzmer, Director of the Cartography & GIS Center, utilized available data to generate maps and analysis of potential compost sites around the city of Milwaukee. Ender’s efforts were stymied somewhat by some unexpected limitations on data collection. We were only able to secure partial data that we requested from some of the commercial composters in the Milwaukee region, either because of competitive concerns or their lack of time to provide the data. For similar reasons we had difficulty collecting the locations of community gardens in the city and their compost requirements. Industry (NAICS) data that we expected to receive from a UW Extension partner but that exchange has been delayed for over a year because the partner has not received the data from his own source. The primary and secondary data that Enders was able to collect enable her to complete senior project paper to earn her undergraduate degree in Biological Sciences, Geography, and GIS, which included maps large vacant lots in Milwaukee that would serve our project as hypothetical composting sites in the modeling and supply chain analysis led Dr. Anthony Ross of the Supply Chain Institute at by UW-Milwaukee. Ross also utilized data from Allen’s thesis and he collected additional and substantial data from Melissa Tashjian, owner of a small but growing compost hauling business serving the Milwaukee region called Compost Crusaders. Ross and his colleague Mark Kosfield have been using the data to create scenarios and conduct sensitivity analysis to examine the impact of establishing new compost sites in areas around the city. They have produced a PowerPoint presentation of their results and a draft paper which currently inform our research and planning process and will eventually be made available to the public. Two groups of students contributed to our compost trials at David Johnson farm. 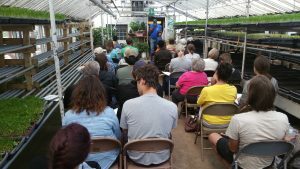 First, under the guidance of Dr. Julie Dawson of the Horticulture Dept at UW-Madison, twelve students conducted a greenhouse study of the our three selected compost products and measured germination and plant growth. While not conclusive, the process of running that study helped us design the outdoor trials. The design of the outdoor trial is pictured below on the left, and a photo of its implementation appears on the right. Higher resolution images will be provided in the future. We are still working on the results of the trials. Aside from whatever scientific conclusions we might make, the compost trials had several positive and intended impacts. One was that we build trust with the three competitive compost producers who supplied their product for the blind study. 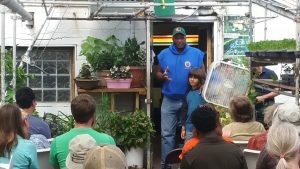 Second, we drew public attention to David’s farm and urban farming in general. Also, there is one bit of anecdotal evidence worth noting. Because of the isolated, multi-week drought that his the Milwaukee area last summer, and the breakdown of the watering system installed under David’s farm, much of his production for the year was lost. However, the plants grow in the compost beds above did considerably better. “The trial plots basically save my CSA farm this year,” he recently reported. In 2018, we will continue integrating the results of all our research into creating a collaborative, multi-sector plan to ramp up Milwaukee’s food-waste-to-compost system. Nicole Endders’ “Finding solutions for diverting food waste from landfills to compost: An urban, vacant lot assessment for the City of Milwaukee, Wisconsin” (link to be provided pending permission from author). We conducted one major educational event in 2017, which occurred on June 24 and was held at the headquarters farm of Growing Power. This workshop was targeted primarily at people living in our project’s targeted 10-zip code area of Milwaukee that experiences food insecurity. The workshop covered the reasons to compost, how to compost, and how to use compost to promote soil and plant health. Our expectation was that the audience would primarily be urban gardeners, rather than urban or rural farmers, and that was the case. 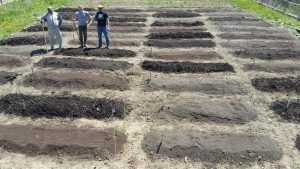 We also planned to hold a field day in the fall of 2017 on the urban farm that hosted our compost research trials. However, we made the determination that the farm was not in a position to host a field day, mainly due to an overgrowth of weeds late in the season. This was a result of the farmer, David Johnson, facing a number of obstacles throughout the season, including personal injury, a period of localized drought in the Milwaukee-area, the technical and mechanical failure of the automated cistern that was installed under his farm, and his need to take on full-time employment outside of farming. He is also relatively new to farming, having now completed three full seasons. The struggles that David faced led a subset of project members to conclude, after several conversation late in 2017, that it was critical that we redirect some of our SARE Project resources to address the educational needs of beginning farmers in the city and the surrounding rural area. We decided to focus most of the 25% project appointment of Ryan Schone of Milwaukee County Extension on reviving his beginning farmer program that was suspended several years ago due to lack of funding. We spent the last month of 2017 developing a plan to hold 6 or more workshops for beginning farmers in 2018. Here is a flyer for the first planned event: Farm-Hack-Festival-Feb-13-2018. The kick-off event was a success. Most of our partners attended the partners-only portion of the event, and we were happy with the number of people who attended the public portion. The event forced project staff to the means to communicate the overall purpose and approach of the project to a diverse audience. We were also able to collect video interviews with several partners which will be used to document our process and progress from start to finish. We still need to review our attendance records to confirm the number of farmers who attended. It was somewhat lower than we hoped, but we also knew it would take repetitive attempts to engage farmers in the project. Invitations to the field day that occurred on August 8 were extended to a smaller group of farmers than we hoped to attract in 2017. Essentially, it was a “practice run.” We intended to promote another field day later in the fall, but due to challenges on our host farm, we canceled that event. In meetings with Farmer Advisors in the fall of 2017, we decided to utilize more of the time of Milwaukee County Extension’s Ryan Schone to organize monthly workshops for farmers in 2018. We always intended to hold partner meetings and possibly public events at the main farm of our partner, Growing Power, led by CEO Will Allen. We did hold a free public educational event in June 24. Forty-six people registered, and although only about 30 actually attended, we felt that was a great success. The aim of the event was not to attract a farmer audience, though we did have 4 farmers serve and presenters and field day host. We will report more on this event in a subsequent draft of this working report. For this 2017 annual report we have discussed education and outreach activities in other sections of this report. We would like to discuss with SARE staff some of our questions about this reporting mechanism. The one educational tool we identify above is the video that we have submitted as a project product.